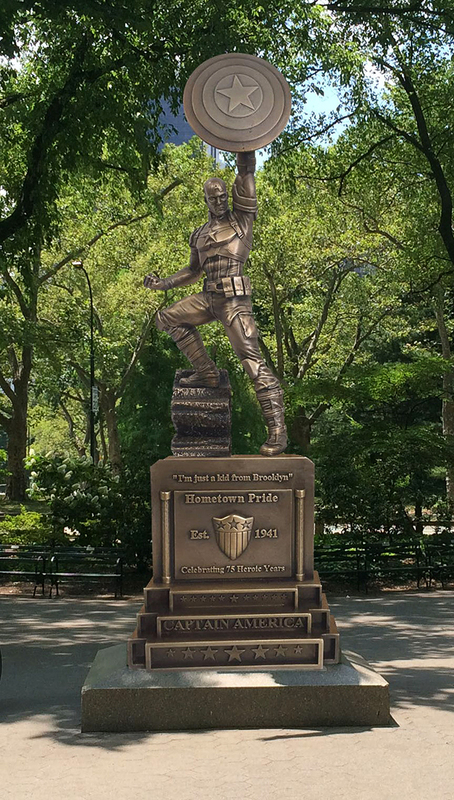 This year sees Captain America reach the 75 years milestone, and to celebrate Marvel has commissioned an awesome 13 foot bronze statue based on the MCU version of the Star Spangled Avenger, complete with the quote “I’m just a kid of Brooklyn” from Captain America: The First Avenger (in the original Joe Kirby and Joe Simon comic Steve Rogers was born on the Lower East Side). Entertainment Weekly has our first look at the special anniversary gift, which will be unveiled at this weekend’s San Diego Comic-Con, where fans can take their picture with it and buy their own miniature replicas. After making its debut at geek mecca, bronze Cap will travel East across the country before settling down for a short time in Prospect Park in Brooklyn. In September, it will move to the borough’s Barclay’s Centre, then heading to Sunset Park in October.